We are looking for interns to help us with our environmental education and community garden programs! 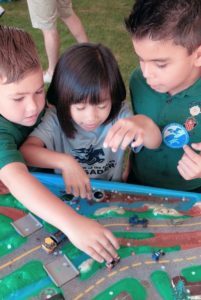 The Environmental Educator Internship will focus on our Watershed Education Program delivered in partnership with the San Diego Unified Port District. The program aims to educate 2nd – 6th grade students about watersheds, how our waterways become polluted, and what students can do to make a difference. Interns will deliver in-class presentations, help promote the program, and assist with program evaluation and administration. Download the position description. The Community Garden Intern will help with the development of a new community garden that will be opening this spring. Tasks will include promoting the garden to local residents, schools, community groups, and businesses; getting gardeners signed up; and assisting in planning gardener meetings and workshops. Download the position description. Please contact Ann Baldridge, RCD Program Manager, with any questions at 619-562-0096.